The Interceptor INT 650 ushers in the idea of the 1960's fun, relaxed motorcycles from the sun-drenched California beaches. With its classic tear-drop shaped fuel-tank, quilted twin-seat and distinctive wide braced handlebars, the Interceptor INT 650 looks every bit the stunning Roadster that it is. A total of 11 options have been developed with the objective of appealing to the discerning heritage seeking rider, just as much as the modern rider seeking a classic motorcycle. 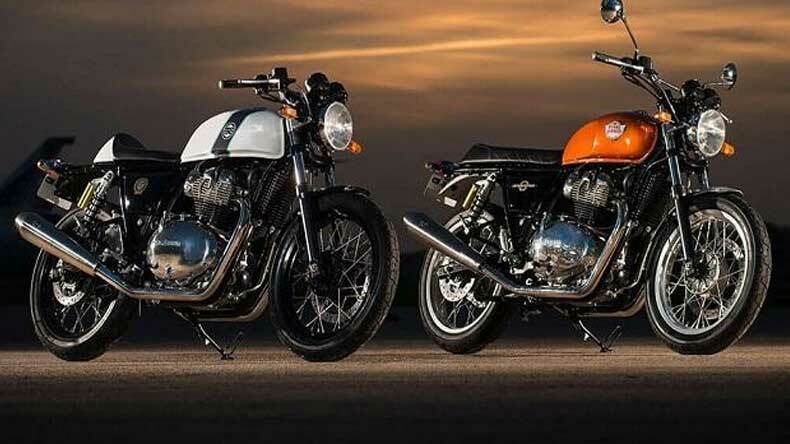 The Royal Enfield on Sunday unveiled its much-awaited Interceptor GT 650 and Continental GT 650 in front of hundreds of bike enthusiasts at its annual rider mania here. Both the motorcycles are powered by an all-new 650cc, air-cooled parallel twin engines with the oil cooler for enhanced performance. The fuel injected motor claims to deliver 47PS of power at 7,100rpm and a peak torque of 52Nm at 4,000rpm. The two motorcycles were unveiled at the EICMA motorcycle show in Italy’s Milan on November 7. The engines have a strong low and mid-range performance, retaining the Royal Enfield character of accessible torque through the rev range. Also new to the Interceptor is the six-speed gearbox, specially developed for this motorcycle. The gearbox is augmented by its ‘slip/assist’ clutch that facilitates easy riding in traffic with a light feel and prevents wheel-hop when downshifting gears – also a first for Royal Enfield. The chassis has been developed from the ground up by the team at Royal Enfield’s UK Technology Centre and Harris Performance. It has been engineered and fine-tuned for enhanced agility that can handle different terrains and speeds with ease while retaining the period classic style. The Interceptor INT 650 ushers in the idea of the 1960’s fun, relaxed motorcycles from the sun-drenched California beaches. With its classic tear-drop shaped fuel-tank, quilted twin-seat and distinctive wide braced handlebars, the Interceptor INT 650 looks every bit the stunning Roadster that it is. He said that with the two new motorcycles, the company wants to upgrade their 2.5 million customers in India who want more from the Royal Enfield. He also said that the new motorcycles will be available in the showrooms by March or April. Without announcing the prices of the new motorcycles, Lal hinted that it would be priced between Rs 3 lakh and 3.5 lakh. Talking about the significance of the new twins in Royal Enfield’s global foray, Lal said: “Royal Enfield aims to lead and expand the mid-weight (250-750cc) motorcycle segment globally. The Royal Enfield Interceptor INT 650 and Continental GT 650 will help grow this segment. “While for our large customer base in India, the new 650 twins will be a compelling upgrade, we believe it will attract customers from other developing markets in SouthEast Asia and Latin America to graduate to the middle weight segment.” Both the Continental GT 650 and the Interceptor INT 650 will be available in variety of colourways and two distinct styles – Standard and Retro Custom.